Can you believe that it is Easter weekend already? That means we are pretty close to the halfway point of the college baseball season. The weekend preview takes us to Greenville, North Carolina to see if the Easter Bunny will show up with a basket full of wins for either Rice or East Carolina. This weekend's series between the two has lots riding on it in Conference USA. Rice has been the bully of the league since joining a few years back; however, the Pirates are looking to change that this season. East Carolina currently sits atop the conference but will they remain there after the weekend? Coach Billy Godwin has been building this East Carolina program since he arrived on campus four years ago. They find themselves perched at the top of Conference USA. After sweeping UAB last weekend, East Carolina dropped both games in the mid-week. They will look to slow down Coach Wayne Graham's Owls, which have reeled off eight straight victories. 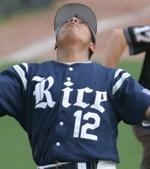 Rice will attempt to return to a spot that they are familiar with in years past, number one in CUSA. Let�s take a look at this series. Easily on their way to a 15th straight NCAA berth, Rice comes in batting .319 as a team with 34 homeruns and 201 RBI on the season. They are led in hitting by freshman infielder, Anthony Rendon, who has a batting average of .388 with 10 homers and 42 RBI. The Owls have swiped 44 bases on the season, with sophomore Rick Hague (.377 avg, 5 HR, 33 RBI) stealing eight. While a Sunday starter has not been named, Coach Graham will send out junior Jared Rogers on Friday and freshman Taylor Wall on Saturday. Rogers has a 2-1 record with a 7.43 ERA, but do not let that fool you. Last weekend, Rogers gave up two earned runs on six hits and three walks while striking out four, which is a career high. Wall decided to duplicate his teammate by giving up two earned runs on six hits and three walks but struck out nine in 6 innings. This raised Wall's record to 4-2 and put his ERA at 4.32. As a team, the Owls have only allowed 13 homers and boast a 3.79 team ERA in 270 2/3 innings pitched. The Pirates have just been crushing the ball. The team average is a whopping .355 with 47 homeruns and 292 RBI. Sophomore Trent Whitehead leads the attack with a .423 average, while senior Brandon Henderson is hitting .405 himself. Junior Kyle Roller leads the team in RBI (41) and has eight homeruns, which tie him for the team lead with senior Stephen Batts (.358, 8, 31). East Carolina will trot out a trio that has not lost a game this season. Junior Chris Heston will start on Friday with his 5-0 record and 2.68 ERA. Sophomore Seth Maness (3-0, 5.40) will do the duties on Saturday, while sophomore Brad Mincey (7-1, 1.93) will climb the hill on Sunday. The staff has a 4.15 ERA with 35 long balls and 131 earned runs given up in 284 innings. This series should be a great one for Pirates fans; however, Rice will find its basket full on Sunday with two wins in Greenville. This interdivisional matchup will attempt to sort out something in a muddied ACC. Both teams are 8-2 in their last 10, but look for the Tar Heels to take the series 2-1 in Tallahassee. After taking two in Athens last week, the Tigers hit the road again this week. This time Tuscaloosa is the destination. With some revived confidence, LSU looks to take it to the Tide. The Tide could use another good series victory; however, they will not get it done this week as the Tigers take two. The two division leaders face off this weekend in Clemson. Miami is coming off a series win versus rival Florida State, while Clemson took two from Duke at home last weekend. The Tigers have been riding the roller coaster lately and will see the Hurricanes come through South Carolina to take two. The Jackets dropped a series at home to the Tar Heels, while the Cavaliers took two from the Terrapins at home. Both teams could use a sweep to make up some ground on Coastal Division leader Miami; however, the Jackets take two at home. Place your ad here. Contact SCS.com for more info. Copyright � 2004-2009 SouthernCollegeSports.com. All rights reserved. This website is an unofficial and independently operated source of news and information not affiliated with any school, team, or league.